I’ll freely admit it. I’m a sucker for horror movies that poke fun at their own genre. I’ve always felt that movies that do this are sharing a little wink with the audience. From Jamie Kennedy’s character, Randy teaching us all how to survive a horror movie in Scream, to finally understanding how victims consistently fall into the same horror movie tropes in Cabin in the Woods, I enjoy being winked at. The mockumentary opens to a world where Jason Voorhees, Michael Myers, and Freddy Krueger are real serial killers stalking real killing grounds. Budding documentarian Taylor Gentry (Angela Goethals) comes to the town of Glen Echo, Maryland to interview and film the town’s very own aspiring slasher villain, Leslie Vernon (Nathan Baesel). Leslie begins walking Taylor and her crew through his process. He establishes the importance of finding the proper place to serve as the anchor for his legend and for the final showdown. He details how he chooses his target group and, most importantly, his survivor girl. Leslie explains to Taylor and crew that a survival girl is the virginal sweetheart who will make it through the night alive before he executes his flyby: his first fleeting contact with Kelly (Kate Lang Johnson), the survivor girl. If you’re a fan of horror movies (especially from the 1980s), you will giggle, snort, and smile the whole way through the setup. It is chock full of Easter eggs and horror movie references that I won’t list here since catching them and having an in-the-know chuckle is half the fun of the film. Now, if you’re a horror fan and have been paying attention to the film, you will start to get a feeling that perhaps things aren’t quite as Leslie is presenting them. You will smile as Leslie starts talking about planting his red herring. You might look around the room to wonder if anyone else is thinking what you’re thinking, but you won’t have much time to assess the looks on your friends’ faces before snapping your head back to the screen to watch Leslie murder his first victim, the librarian Mrs. Collinwood, as adorably played by Zelda Rubinstein (Poltergeist). Kelly is saved in this scene by Doc Halloran, played by none other than Mr. Freddy Frikkin’ Krueger himself, Robert Englund. I jump up and down almost as excitedly in the real world as Leslie, Eugene, and Jamie do on screen as they declare that Leslie has found his “Ahab” in Doc Halloran. He is the good to Leslie’s evil, the man who will hunt Leslie till death because that is the right thing to do. While going behind Leslie’s back to try and speak to Kelly, Taylor and crew speak to Doc Halloran who reinforces what some astute audience members already suspect; Leslie is not who he says he is. His last name is Mancuso, not Vernon, and he is not the boy from local legend. Likewise, no one is playing the part they think they are. However, Leslie continues to guide Taylor and crew through his plans for his night. He describes step by step how he will manipulate each character into the position he needs to make his plans go off without a hitch. He comments on imagery and psychology as he details how his murder spree needs to play out. It isn’t until the shooting style changes from a documentary style to a more traditional one, the fourth wall mended and fortified, that intentions are made clear and audience suspicions about who is really who are confirmed. The audience straps in for the cleverly done finale. Is it a perfect movie? No. It has its problems. I take issue with Leslie being able to best people who absolutely know beyond question what’s coming. And perhaps I’m a sap, but I actually wanted to see a deeper relationship between Leslie and Survivor Girl. I don’t know why. Maybe I was hooked on an idea presented earlier in the film. Maybe I’m just trying to impose my own preference, which is a total jerk move to pull in a review. 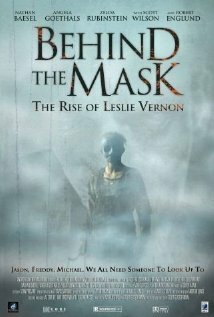 So, while I don’t believe Behind the Mask: The Rise of Leslie Vernon is a perfect film, it is one hell of a fun ride, one I’ll happily go on over and over again. I give it 4 out of 5 scythes. Are you looking for a book to get you in the Halloween spirit? The Shining has always been one of my favorites. Perhaps because it was my first “grown up” horror experience. Since then, I have seen a lot of horror movies and read a lot of horror books. Stephen King has remained on the top of my list. I think it is because of the nature of his writing. He brilliantly weaves real life with the supernatural. This is a clever way to allow the reader to feel secure about reading things that normally might just hit a little too close to home. I happen to think that this layer of reality is what makes his books scary. It gives them some real teeth. The Shining is no exception. In fact, I think it is one of the best books of his to start with because it showcases his early writing so well. We have an ordinary family, the Torrances, with very ordinary problems. They are then thrown into an extraordinary and dangerous situation; specifically, a haunted hotel called the Overlook. The extraordinary then pushes these people to the brink, forcing them to either battle their monsters or to become them. These battles, in my humble opinion, are far scarier than whatever is in room 217 or the hedge monsters because these are the battles that people have to fight every day. It is a battle that can be lost at any time with very real consequences. The reader gets to see that early on with Jack Torrance. Yes, the ghosts are scary and, yes, we worry about Danny but it is the humanness of it all that is the scariest. That really makes us care about what is happening in the Overlook Hotel. The Shining is one of my favorite books for these reasons. If you are looking to try the film, there are two versions. I like do the 1980 movie version despite it losing parts of the book, but Jack Nicholson is wonderful in it. The 1997 miniseries is a lot closer to the book and the version I prefer. I have found that to be true with a lot of King’s miniseries since they were able to keep more of the book without having to worry about a run time. So, if you are looking for a good scare this Halloween, pick up a copy of The Shining! You won’t regret it. If you have read it, then perhaps you should give it a quick reread before picking up a copy of Doctor Sleep, which is the wonderful sequel.